Glaciers can influence societies in their catchment area in different ways, they act as a water storage for dry summers, but glaciers can also trigger geological catastrophes and endanger people. Glacier outburst floods (GOF) refer to the rapid and sudden discharge of water from within a glacier or from an ice-dammed lake, within minutes to hours a flood wave occurs possibly damaging infrastructures and killing people kilometres away from the glacier which initiated the disaster. In the Alps and North America most outburst floods occur in summertime when during melt-season large quantities of water can accumulate inside the glacier or as ice-dammed lake. In the Andes and the Himalaya also a second type of floods is common, outbursts from moraine-dammed lakes, referred as glacial lake outburst flood (GLOF). The area between the moraine and the retreating glacier can be filled with the melt-water, and as the glacier continues to shrink the lake continues to grow. Various processes can lead to the failure of a moraine dam, waves and currents of the lake can erode the dam, ice contained in the dam can melt, the detritus forming the dam can settle with time and so lowering the effective height of the dam. Fig.1. Laguna Paron (4.140m a.s.l. 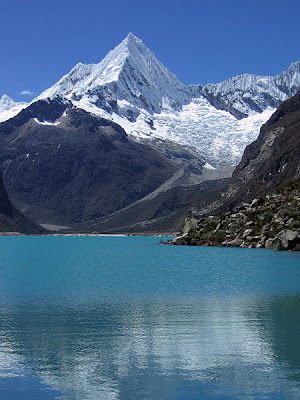 Cordillera Blanca - Peru, foto from Wikipedia) in 2009, a lake dammed by the debris-mantled glacier Hatunraju with a capacity of 75 million cubic metres before the lake level was lowered by 20 meters artificially by tunnelling through bedrock on the left of the moraine dam. The lake is surrounded by moraines 250m high. It is unknown how stable the moraine of Hatunraju is, if this dam fails a flood of around 50 million cubic metres could sweep downstream and severely damage the town of Caraz, 16 kilometres away. The worst glacial lake outburst in historic time was caused by the failure of such a moraine-dam in Peru. December 3. 1941 the town of Huaraz was partially destroyed by a flood that killed 60.000 people. Floods resulting from moraine-dam failure have been increasing in frequency in the Himalaya over the past 70 years or so, although in terms of loss of life they have been by accident much less disastrous then in the Andes. One of the best-documented outburst floods in Nepal took place on 4. August 1985 when the terminus of the Langmoche Glacier in the Khumbu Himal collapsed into Dig Tsho glacial lake (Video), creating a displacement wave hat overtopped the moraine dam and triggered its collapse. Estimated 10 million cubic metres of water were released - the wave destroyed a power plant and five people were killed and eroded and destabilized the valley floor for 90 kilometres downstream. This case triggered major research projects of potential dangerous glaciers and glacial lakes, until 2004 more then 20 potentially dangerous lakes in Nepal and 24 in Bhutan were identified, one of the most impressive and dangerous case was lake Tsho Rolpa (4.450m a.s.l. ), fed by the Trakarding Glacier. By 2002 the lake was 3,5 kilometres long, 0,5 kilometres width and 135m deep, with an estimated volume of 110 million cubic metres. The moraine damming the lake up was 150m high, with a core of decaying ice. Emergency measures were initiated with the installation of an early-warning system to detect downstream travelling a flood-wave and later by the construction of an artificial spillway, lowering the lake by 4 metres. However these are considered only temporary solutions, as a lowering of the lake level by at lest 15 to 20 metres is necessary to prevent spillover or failure of the dam crest, a costly procedure in this region. This last case shows also the financial problems facing poor countries, often disaster prevention or mitigation are limited by the available resources, and considering the continuing glacier retreat expected in the next decades the increase of problematic lakes (both in number and volume) will by of major concern in the future. Fig.2. 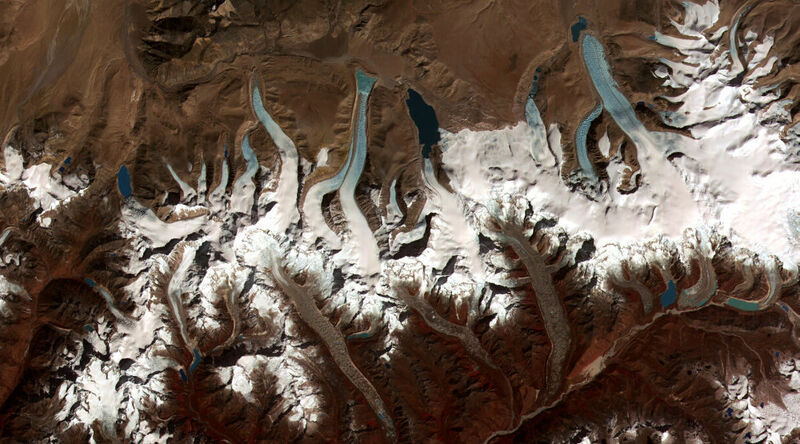 The glacierized Himalayan border region of Bhutan (bottom) and Tibet (top) seen in a satellite image. From the crest of the mountain range clean glaciers flow northwards onto the Tibetan Plateau, while debris-mantled glaciers flow south into densely forested valleys. At bottom right are a series of moraine-dammed lakes and incipient lakes, formed by the rapid coalescence of supraglacial ponds. The large lake at the very right is lake Luggye Tsho. A breach of the dam in 1994 led to severe flooding and loss of life up to 200 kilometres downstream. (ASTER-image by NASA, 08 June 2006). 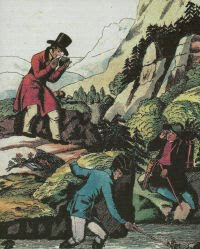 HORSTMANN, B. (2004): Glacial Lake Outburst Floods in Nepal and Switzerland. New Threats Due to Climatic Change. Germanwatch - Bundesministerium für wirtschaftliche Zusammenarbeit und Entwicklung. KALTENBORN, B. P., NELLEMANN, C., VISTNESS, I. I. (Eds) (2010): High mountain glaciers and climate change - Challenges to human livelihoods and adaptation. United Nations Environment Programme, GRID-Arendal.